Our regular classes in Sheringham, North Walsham and Fakenham (see our Events page for more info) incorporate Singing for Breathing principles to help improve lung health. There is a growing body of evidence that shows how singing regularly with others is good for your general health and wellbeing and it is especially good at improving your quality of life if you’re living with a lung condition. Our Sheringham ‘Singing for Health’ class (see our Events page for more info) was set up originally as a joint project between Playing for Cake and North Norfolk’s Breathe Easy Support Group, to encourage people with lung conditions to sing. However, it now runs independently and is open to anyone to come along to reap the health benefits of singing with others. Everyone is welcome! The classes are suitable for anyone interested in singing and music-making with others and having fun while reducing stress, tension and improving their general health and wellbeing. This class is also suitable for people with Parkinson’s and it is linked with our Sing to Beat Parkinson’s programme. The singing groups are extremely friendly, supportive and most importantly, great fun! You don’t need to have attended singing groups before – or feel that you’re a great singer – come along and give it a go! Please do get in touch if you have any queries. 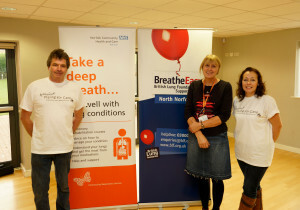 This class was originally set up as a ‘Singing for Breathing class’ in collaboration with North Norfolk’s Breathe Easy Support Group and the respiratory team based at Kelling Hospital, within initial funding from Tescos Bags of Help.